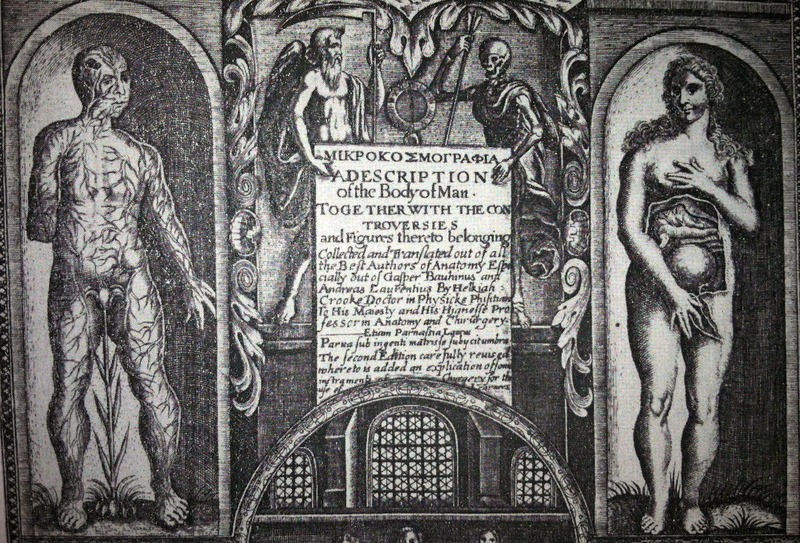 The lower half of Crooke’s title page features the images of two bodies, one male and one female. 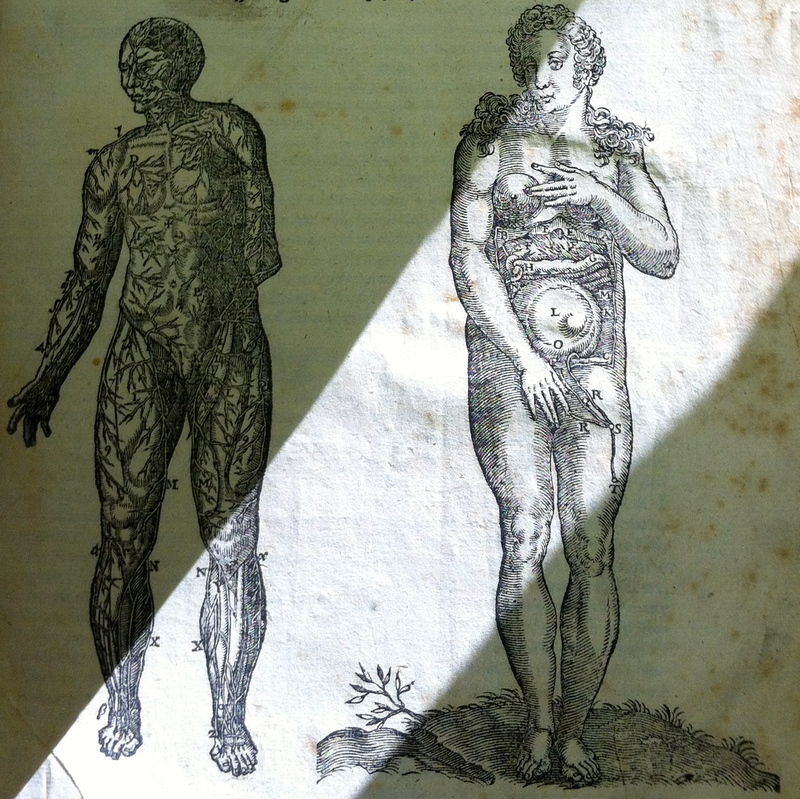 Like the rest of Crooke’s illustrations (and much of his text), these originated in other sources, “the veined man from a zodiacal chart on phlebotomy and the woman from an almanac,” according to Elizabeth Lane Furdell in Publishing and Medicine in Early Modern England (52). C.D. 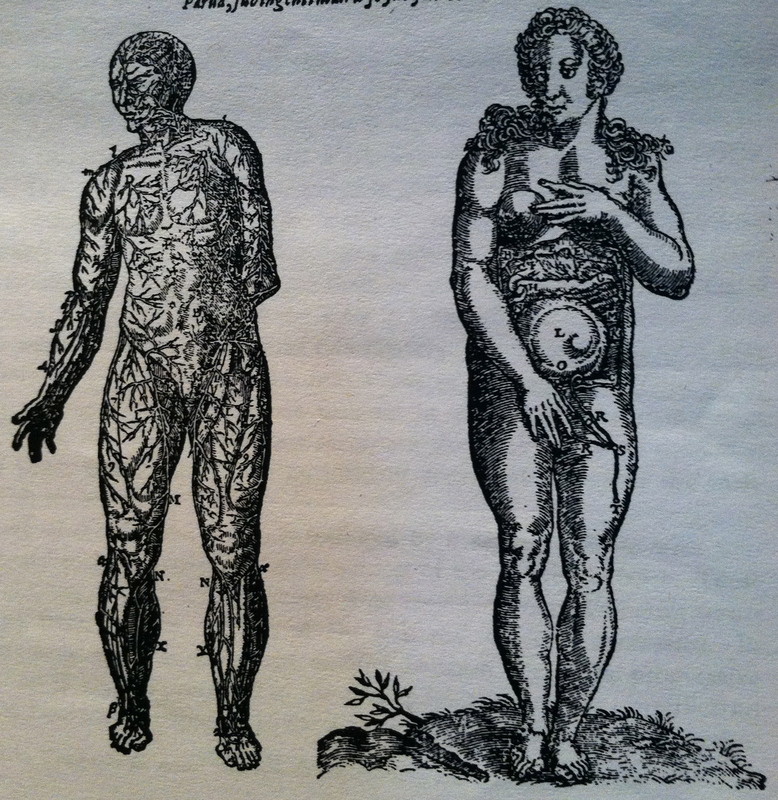 O’Malley, who sees the inclusion of these images on the title page as a blatant flaunting of Crooke’s defiance in regard to the book’s attempted suppression, identifies the illustrations as “a male and a pregnant female figure borrowed from Bauhin’s Theatrum anatomicum, the latter one of the so-called indecent figures previously condemned by the College” (8). That these sources cite different origins for the illustrations may be due to differing images in subsequent editions; the 1631 Mikrokosmographia title page is much more intricate but still includes the two figures. The female appears softer but retains her previous posture and form, while the male undergoes more significant changes; although he remains veined and inexplicably one-armed, his veining is less detailed (appearing more stylistic and less scientific), he is turned to face the center of the page, and a conveniently placed lily grows to cover his more potentially offensive parts. 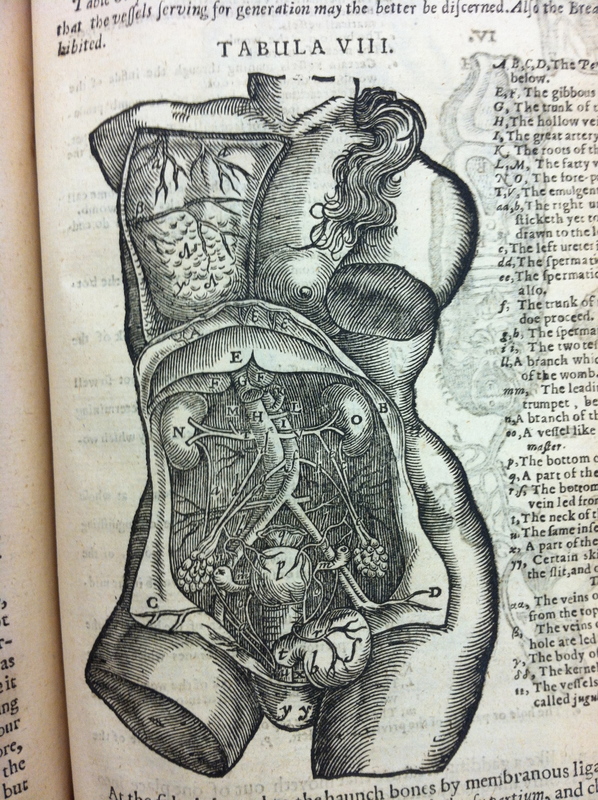 This may have appeased Crooke’s more prudish readers, but there is an odd juxtaposition in revealing the man’s circulatory system while veiling his external genitalia. 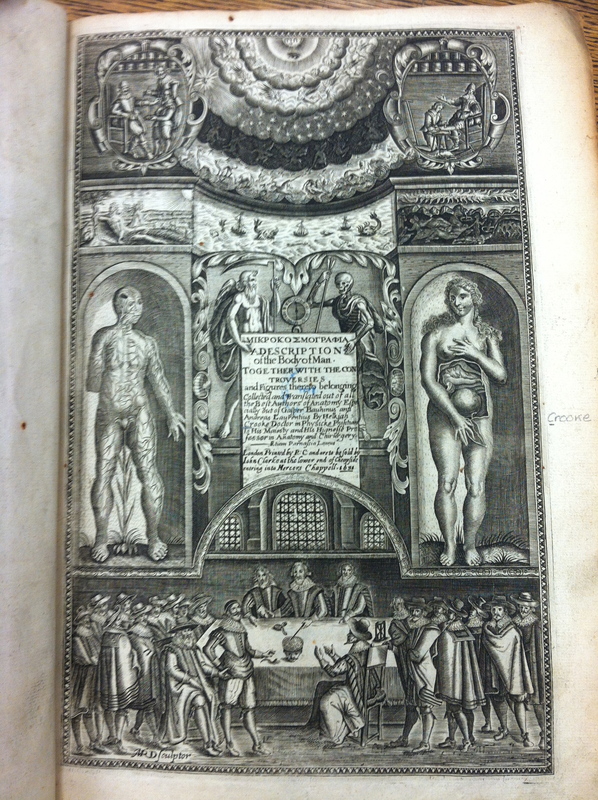 A photocopy of the reproduction of the engraved 1631 title page provided by O’Malley in his Bulletin of the History of Medicine article and credited to the “Wellcome Trustees”; the image no doubt originates from a copy held by the Wellcome Trust in England. Although there appears to be little in the image to verify that this is, indeed, a pregnant woman (as O’Malley notes), the same illustration does appear in the volume’s Book Four, “Of the naturall parts belonging to Generation,” where it is labeled: “Table x. sheweth the portrature of a woman great with child whose wombe is bared and the Kel taken away, that the stomacke, the guttes and the wombe might bee better seene” (V6v). According to the OED, “kel” is more commonly spelled “kell” and, given this context, would refer to “the fatty membrane investing the intestines”; this is what later becomes the word “caul” (although the alternate spelling “calle” also appears as early as 1382). 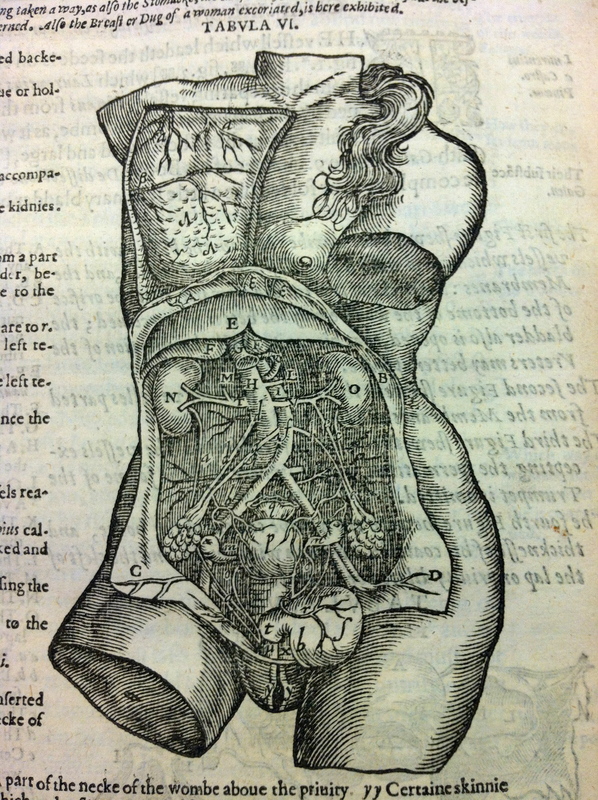 In any case, this female figure is certainly an excellent example of the “self-demonstrating” anatomy subject Jonathan Sawday describes in The Body Emblazoned (113), as she coldly offers her best-kept secrets to the reader’s gaze.
. . . the title page, that is. I continue to be surprised by the tangents this project takes me on, but then I have to remember that was part of my goal in creating this blog. My current knowledge base is incredibly limited, so exploring the various issues that arise in the Crooke book gives me the opportunity to read further and learn more about aspects of seventeenth century England I would never have thought to explore. I have a lot more research to do before I can offer any real insight on the true nature of the relationship between Crooke and James I, so I’m going to continue that work behind the scenes and keep moving with the book here. Published by the Kings Majesties especiall Direction and Warrant according to the first integrity, as it was originally written by the AUTHOR. As I’ve mentioned, we’ll come back to Crooke and the king. But I believe that the second part of this sentence – “according to the first integrity, as it was originally written by the AUTHOR” – refers to another significant event related to Mikrokosmographia: the attempted suppression of its publication. Called before the College, Crooke took a month to make an appearance and then apparently refused to accede, as the College next tried to intimidate his publisher and the President threatened to burn all copies of the book he could get his hands on. In a final effort to induce the cooperation of the author and publisher, the College delegated two of its fellows to emend the offensive portions, but with no greater success, and finally the book was printed in its original form, “according to the first integrity, as it was originally written by the AUTHOR.” I find it intriguing that after all this righteous indignation and furious threatening, there appears to have been no real negative consequences to Crooke’s blatant defiance – aside from its cooling affect on his relationship with the College of Physicians, which was none too warm to begin with. This relationship, like that of Crooke to James I, is another complicated one I need to research further before I can offer any greater insight.